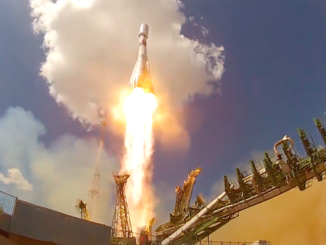 A commercial satellite designed to broadcast hundreds of television channels across Europe and better link European surveillance satellites and the International Space Station to scientists on the ground took off Friday from Kazakhstan aboard a Proton rocket. The Eutelsat 9B communications satellite carries conventional Ku-band transponders primed to beam television signals to homes and businesses from the United Kingdom to the Middle East. A high-tech laser communications terminal is also fastened to the satellite, which will become the first node of the European Space Agency’s new data relay service to connect spacecraft in low Earth orbit with users at unprecedented speeds. Soaring from a launch pad at the Baikonur Cosmodrome, a historic spaceport on the the frigid plains of Kazakhstan, Eutelsat 9B rode into space at the tip of a Proton rocket. The 19-story hydrazine-fueled booster ignited its six RD-276 main engines at 2220 GMT (5:20 p.m. EST) Friday and climbed into a starry sky to the northeast from Baikonur, dropping its first stage two minutes later. Two more rocket stages accelerated the Eutelsat 9B satellite on a ballistic, suborbital trajectory, then the Proton’s Breeze M upper stage fired five times push the 11,380-pound (5.2 metric ton) spacecraft into an elliptical geostationary transfer orbit. The last firing by the Breeze M’s main engine occurred more than 22,000 miles (nearly 36,000 kilometers) above Earth to raise the low point of its orbit and move Eutelsat 9B closer to its final operating post over the equator. 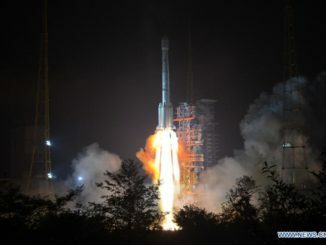 The Eutelsat 9B satellite separated from the Proton rocket’s Breeze M upper stage at 0732 GMT (2:32 a.m. EST) Saturday, and officials declared the launch a success. The mission aimed to place Eutelsat 9B in an orbit ranging in altitude from a low point of 2,761 miles (4,444 kilometers) to a high point of 22,180 miles (35,696 kilometers), with an inclination of 12.18 degrees. Eutelsat 9B’s own engine will do the rest of the job to put the spacecraft in a circular orbit 22,300 miles (36,000 miles) directly above the equator at 9 degrees east longitude. Paris-based Eutelsat confirmed the satellite completed a partial deployment of its power-generating solar panels about two hours after separating from the Breeze M upper stage. The flight plan calls for the solar arrays to be fully extended later. The Eutelsat 9B satellite, based on Airbus Defense and Space’s Eurostar E3000 spacecraft bus, is designed for a 15-year mission. 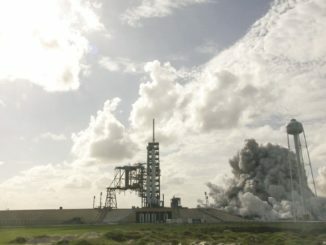 “The Eutelsat 9B launch truly represents an example of an international partnership: a European-made satellite for Eutelsat with an ESA/Airbus Defence and Space payload launched on a Russian rocket by an American company,” said Kirk Pysher, president of International Launch Services, a Virginia-based company responsible for commercial Proton rocket flights. Friday’s launch marked the 92nd Proton mission managed by ILS, which is owned by Khrunichev, the launcher’s manufacturer. 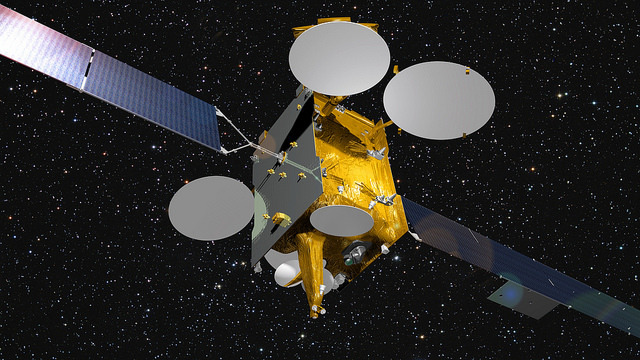 In March, Eutelsat 9B will be in its final operating position and begin broadcasting television programming. Eutelsat 9B’s coverage zone stretches across Europe and the Middle East, with four regional Ku-band beams focused on high-growth TV markets in Germany, Greece, Italy, the Nordic countries, the Baltic states and Ukraine, according to Eutelsat. The new satellite will replace Eutelsat 9A, a satellite launched in 2006, which will be repositioned to a new location to continue its mission for Eutelsat. 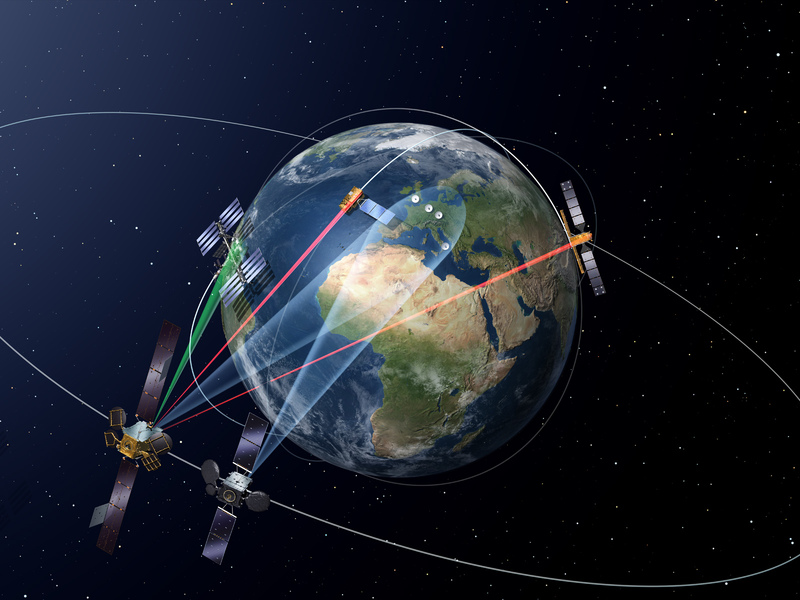 Eutelsat 9B also hosts a laser communications package to link with satellites in low Earth orbit and pass data to control centers in Europe, bypassing remote ground stations that can only connect with orbiting spacecraft part-time. The laser terminal is the first of at least two planned for the European Data Relay System, a public-private partnership with a budget of about 500 million euros ($545 million). The anchor customer for the data relay network is the European Commission, which owns a fleet of Earth observation satellites with instruments to take regular pictures of the planet, measure atmospheric chemistry and ocean parameters, and track the retreat of polar ice sheets. Europe’s Sentinel 1 and Sentinel 2 satellites, fitted with radar and optical imaging systems, will send their imagery to users via the EDRS network. Getting the environmental data into the hands of users — including security agencies, maritime operators, businesses, farmers, scientists and European citizens — is paramount to fulfilling the promise of the Copernicus program, officials said. The EDRS laser terminals in geostationary orbit will lock on to transmitters aboard the Sentinel satellites from a range of up to 28,000 miles (45,000 kilometers) and stay in communication with the spacecraft over half the time, a significant improvement over the limited visibility of ground stations. The laser system allows data to stream from Earth observation satellites to the EDRS network at up to 1.8 gigabits per second, about 90 times faster than a typical modern Internet connection, according to Evert Dudok, head of communication, intelligence and security at Airbus Defense and Space, the EDRS program’s prime contractor. The data relay network developed by Europe will pass up to 50 terabytes of data between observation satellite and users every day. By 2018, the EDRS lasers will be able to connect with the International Space Station, helping relay video and imagery to the ground at rates not possible today. “EDRS is the tool that will make Earth observation on such a scale a manageable proposition,” said Magali Vaissiere, director of the European Space Agency’s telecommunications and integrated applications division. “The maritime sector is the one currently crying out loudest for more real-time data. For example, some important shipping routes go through the North Pole region, where thick ice flows can cause damage to cargo and vessels and even threaten human life. Airbus Defense and Space is responsible for finding other customers for the signals relay system, which is branded the SpaceDataHighway. Candidates to use the laser communications system include military spy satellites, airborne drones and other data-intensive craft. New spy satellites in development by France and Germany will not utilize the EDRS laser capability, but Airbus officials are seeking a deal with the U.S. Defense Department to link intelligence analysts with military drones through the European data relay network. “For Eutelsat, it is a privilege to be hosting this groundbreaking SpaceDataHighway that will use lasers to send data to GEO (geostationary) from LEO satellites, UAVs and even the ISS,” de Rosen said. The laser terminal aboard Eutelsat 9B, a bit larger than a typical kitchen microwave oven, is officially called EDRS A. The second EDRS node — named EDRS C — will launch on a dedicated satellite in mid-2017. ESA and Airbus want to build at least one more laser package to extend the EDRS program’s reach global by 2020, but the third laser terminal still needs funding. Friday’s Proton launch puts Europe’s ExoMars mission next on the Russian rocket’s manifest. ESA’s ExoMars orbiter and lander will launch from the Baikonur Cosmodrome on March 14, heading on a seven-month journey to Mars on a mission to search for the source of methane that intermittently spills out into the Martian atmosphere. The piggyback landing craft will attempt to become the first European probe to return data from the Martian surface.